When parents call our office to inquire about our dance classes for kids, they often want to enroll children who “dance around the kitchen all day.” They have reasons like socialization, cultural exposure, energy dissipation, etc. I believe that a dance education is a vital part of every child’s education. At young ages, dance is more important than many other ‘educational activities’ that are out there for young children. Why dance? All physical activities consist of movements, whether it is playing soccer, braiding your hair, or writing. There is inestimable value for children in controlling their movement to be focused, creative, and purposeful. This takes practice. The art form of controlled movement is dance. Creating your own movement and dance gives students the opportunity to practice ‘cognition’ (thinking) in a way that is unique because it is so globally encompassing. The brain must make a large number of decisions for varying body action after taking in a variety of information. Dance is not just hand/eye coordination; it is eye/ear/all body parts/abstract reasoning coordination! The student must focus on the whole self, which leaves less room for distractions that pull them away from purpose. Studies have shown that this learning-how-to-be-very-focused carries over into classroom behavior and enhances more traditional academic skills. And it is a natural for kids! They like to move and improvisation has no right or wrong (only on task and off), so it often makes successes for children not so successful in traditional academic settings, as well as allowing children who are too self- controlled to have the opportunity for experimentation in an area where it is valued. Dance also fosters a strong sense of group awareness and teaches children to work in a cooperative and sharing environment, and to respect and be aware of the work of each individual in the group. This form of dance, creative movement, is not step oriented or culturally connected. It deals with the basic elements of any form of dance or movement: space, time, and force. To give children a more formal understanding of those elements, they work in guided improvisations. For example, we start the year with ‘go & freeze’ and ‘in place vs. traveling’. We improvise around the idea of how each body part moves and how to move each in a more ‘fancy’ way, either in place or with locomotion. We also learn about ‘making shapes’, ‘levels’ ‘moving fast vs. slow’, and ‘moving sharp, smooth, or with other qualities. We often apply the concept of the day to a story. For example, in one ‘shapes’ unit we did the Museum Dance. This lesson teaches geometric shapes, understanding emotion and situation (the janitor is surprised that she can’t see the shapes moving when she looks), sequential understanding (following a story), and imagination. We often work with a prop, such as hoops, cones, or parachutes to foster hand-eye coordination and to spur creativity. 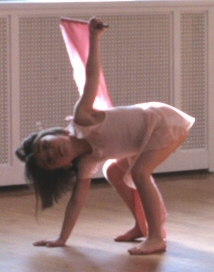 Creative movement dance is a unique form of learning. And it is that unique-ness that makes it so valuable for youngsters. When you learn something with your whole self, your brain and your body, with each totally involved, that experience changes and deepens you in a way that few other experiences do. And when you mix that with fun (who says all experiences must be serious to be meaningful?) we send children a powerful message indeed.